In April, a room at the Center was converted into a photography studio with all of the necessary equipment for taking pictures and making films. Children who find shelter at the Center are often the victims of sexual assault, verbal abuse or neglect that have jeopardized their health and safety. As a form of intervention, art therapy has shown to be effective in the treatment of trauma disorders. 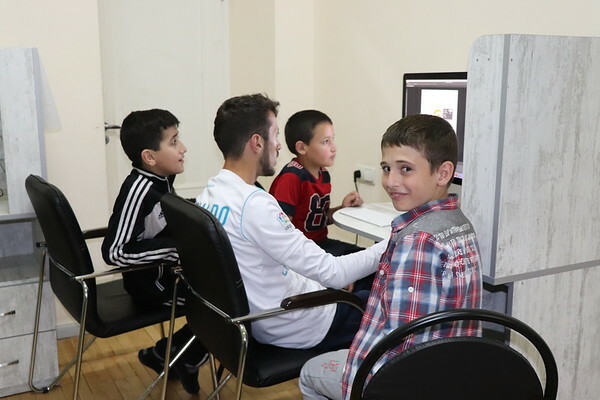 “Art therapy, especially photography, is particularly beneficial to children as they are usually less capable and less comfortable expressing themselves with words,” said Manane Petrosyan, the Center’s program manager. The new studio offers both photo and video classes and workshops on a daily basis. Children between seven and 17 years are grouped by age, and start by first learning photo and video techniques that include basic use of the cameras, and rules and tips for framing and setting up decent quality images. The next step is experimenting with taking photos and video. Then they move on to editing. Artur Avagyan teaches photography. A former Children’s Center beneficiary, Artur found a true “home” at the Center , even after he was taken in by a foster family as a child. A former soldier, Artur now studies painting at Terlemezyan State College of Fine Arts. Nver Kirakosyan, who teaches videography, has been cooperating with the Children’s Center as a volunteer for the past seven years. He used to volunteer to teach photography on the side to a select few of the Center’s children while he was working at the reception desk. Last year, he presented the idea for the installation of a permanent photo studio as part of an initiative he called Support Dreaming. Currently, they are both enrolled in FAR’s Gulamerian Scholarship Program. “We want to help children overcome some of their problems. Before we decide on photo/video assignments for them, we consult with Center specialists and try to focus on what’s been deemed ‘a problem’ for each child. For example, if we learn that a child has trouble following proper hygiene practices, we assign him/her to do some hygiene-focused photos, for example capturing the morning routines like brushing teeth and combing hair—things that other children do before they have breakfast,” said Nver. Artur and Never plan to have a photo and video exhibition at the beginning of June, when they should have enough material produced by workshops participants to display. Nver said they have already decided on name for the future exhibition: Menk, or “We” in English.